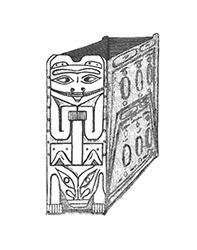 Sealaska Heritage Institute (SHI) next week will host a professional ethnographic object conservator to perform a critical-condition assessment, do general cleaning and recommend conservation treatments for an old Tlingit box drum repatriated in 2011 to the T’a̱kdeintaan Clan of Hoonah. Through the project, funded through a grant from Museums Alaska, SHI in partnership with the clan also will hire a professional photographer to make infrared scans of the large drum, which are expected to reveal the original formline design. SHI will host art conservator Nicole Peters of Peters Art Conservation Services, LLC., of Skagway from Oct. 16-18 at the Walter Soboleff Building in Juneau. Peters’ work will include basic cleaning, removal of surface dust and loose particulate matter, assessment of any structural issues, repairs (if needed), and other tasks. Photographer Brian Wallace will make infrared scans at a later date. Reporters and photographers are welcome to cover the process. The project will ensure the long-term preservation of the box drum by reducing the rate of deterioration to a tolerable level. Information gleaned from the condition assessment, conservation treatments, and infrared photography will support research, educational, and exhibit efforts by SHI and its tribal constituents. The box drum has a storied history. The design on the drum was copied as a sketch by the German geographer and author Aurel Krause during his visit to Hoonah in the late 1800s. Krause later published the sketch in his book Die Tlinkit-Indianer: Ergebnisse Einer Reise Nach Der Nordwestküste Von Amerika Und Der Beringstrasse, which translates as The Tlingit Indians: Results of a trip to the Northwest Coast of America and the Bering Strait. In 1924, the drum was collected by Louis Shotridge for the University of Pennsylvania Museum of Archaeology and Anthropology. The T’a̱kdeintaan Mt. Fairweather House—in partnership with the Hoonah Indian Association, Huna Totem Corporation, Huna Heritage Foundation, Sealaska and SHI—in the late 1990s launched a vigorous campaign to repatriate the drum and nearly 50 other items housed at the museum. The parties argued before the Native American Graves and Repatriation Act (NAGPRA) Review Committee in 2010 that the 1924 transaction was illegal because the T’akdeintaan Clan never agreed to alienate the objects. The committee sided with the Native groups, and in 2011, the museum returned eight of the pieces, including the box drum. The museum returned three additional items to the clan this week in a ceremony at SHI and will return the remaining 35 in the near future. The drum currently is on long-term loan to SHI, which, if it can be stabilized, will place the object in its permanent exhibit, Enter the World of the Tlingit, Haida, and Tsimshian Peoples, in the Nathan Jackson Gallery in the Walter Soboleff Building in Juneau. It will also be made available to the T’akdeintaan Clan members, scholars, artists and other researchers. 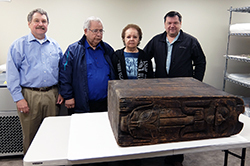 Captions: The box drum with SHI History and Culture Director Chuck Smythe, Ron Williams of the T’akdeintaan Clan and his wife Julie, and Robert Starbard of the T’akdeintaan Clan; drawing of the box drum made by author Aurel Krause that appeared in his book Die Tlinkit-Indianer: Ergebnisse Einer Reise Nach Der Nordwestküste Von Amerika Und Der Beringstrasse (published in English as The Tlingit Indians, p. 167).